Jim Hall, Guitar - Jimmy Giuffre, Saxophone, Writer, MainArtist Copyright : 2005 Atlantic Recording Corp. Manufactued & Marketed by Warner Strategic Marketing 1988 Atlantic Recording Corporation for the United States and WEA International Inc. for the world outside of the United States. Jim Hall, Guitar - Jimmy Giuffre, Clarinet, Writer, Whistle, MainArtist Copyright : 2005 Atlantic Recording Corp. Manufactued & Marketed by Warner Strategic Marketing 1988 Atlantic Recording Corporation for the United States and WEA International Inc. for the world outside of the United States. Jerome Kern, Writer - Hammerstein, Writer - Jim Hall, Guitar - Jimmy Giuffre, Tenor Saxophone, MainArtist Copyright : 2005 Atlantic Recording Corp. Manufactued & Marketed by Warner Strategic Marketing 1988 Atlantic Recording Corporation for the United States and WEA International Inc. for the world outside of the United States. Russell, Writer - Sigman, Writer - Jim Hall, Guitar - Jimmy Giuffre, Clarinet, MainArtist Copyright : 2005 Atlantic Recording Corp. Manufactued & Marketed by Warner Strategic Marketing 1988 Atlantic Recording Corporation for the United States and WEA International Inc. for the world outside of the United States. Russell, Writer - Jim Hall, Guitar - Jimmy Giuffre, Clarinet, Writer, MainArtist Copyright : 2005 Atlantic Recording Corp. Manufactued & Marketed by Warner Strategic Marketing 1988 Atlantic Recording Corporation for the United States and WEA International Inc. for the world outside of the United States. Jim Hall, Guitar - Jimmy Giuffre, Tenor Saxophone, Writer, MainArtist Copyright : 2005 Atlantic Recording Corp. Manufactued & Marketed by Warner Strategic Marketing 1988 Atlantic Recording Corporation for the United States and WEA International Inc. for the world outside of the United States. Jim Hall, Guitar - Jimmy Giuffre, Clarinet, Writer, MainArtist Copyright : 2005 Atlantic Recording Corp. Manufactued & Marketed by Warner Strategic Marketing 1988 Atlantic Recording Corporation for the United States and WEA International Inc. for the world outside of the United States. 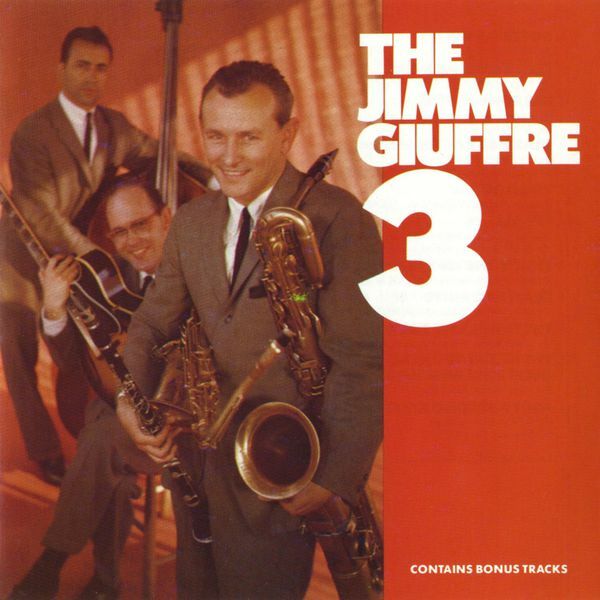 Jim Hall, Guitar - Jimmy Giuffre, Clarinet, Saxophone, MainArtist - Jimmy Giuffrie, Writer Copyright : 2005 Atlantic Recording Corp. Manufactued & Marketed by Warner Strategic Marketing 1988 Atlantic Recording Corporation for the United States and WEA International Inc. for the world outside of the United States. J. Giuffre, Writer - Jim Hall, Guitar - Jimmy Giuffre, Clarinet, Writer, MainArtist Copyright : 2005 Atlantic Recording Corp. Manufactued & Marketed by Warner Strategic Marketing 1988 Atlantic Recording Corporation for the United States and WEA International Inc. for the world outside of the United States. Warren, Writer - Dubin, Writer - Jim Hall, Guitar - Jimmy Giuffre, Clarinet, Saxophone, MainArtist - H. Warren, Writer - A. Dubin, Writer Copyright : 2005 Atlantic Recording Corp. Manufactued & Marketed by Warner Strategic Marketing 1988 Atlantic Recording Corporation for the United States and WEA International Inc. for the world outside of the United States.